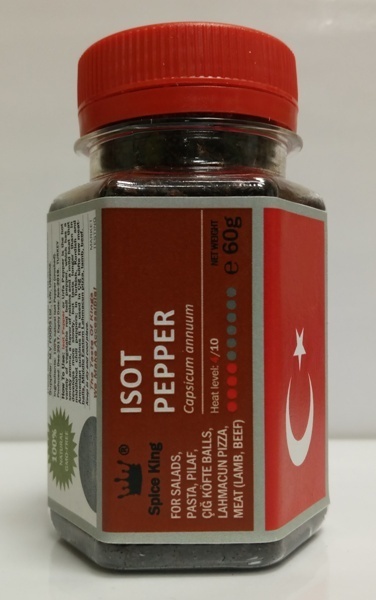 ISOT PEPPER Crushed (other names: Isot Biber, Urfa Biber). Ingredients: 100% natural Isot Pepper (crushed). How To Use: Isot Pepper or Urfa Pepper is the hot variety of vegetable red bell pepper, which has a smoky aroma, a flavor of raisins and a mild heat that develops more slowly, but lasts longer than in middlehot chili peppers; in Turkish, Kurdish and Armenian cuisines it is used in Çiğ köfte raw meat-balls, Middle Eastern Lahmacun pizza, lamb, beef. 60 g net weight (100ml PET jar) - USD 2.00 (USD 33.33/kg).